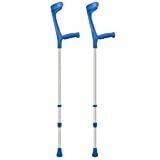 Adjustable Economy Crutches – BLUE. This blue pair of modern looking Adjustable Economy Crutches offer exceptional value for money for those looking for style, comfort and stability. These stylish blue crutches have strong non-twisting forearm cuffs and ergonomic soft grip handles, for maximum user comfort and safety. With the height increment adjustments available these crutches also offer a great height range of 762mm (30″) to 965mm (38″). This entry was posted in Health Products and tagged Adjustable, Blue, Crutches, Economy, Healthcare by Healthy Senior Lifestyle. Bookmark the permalink.